The summer mowing season is quickly approaching and that means it’s time to start researching that new mower! If you’re in the market for a new riding mower this year then be sure to check out the huge selection of top brands at The Home Depot. The Home Depot is lowering the cost of a well-groomed personal pasture. The Home Depot also has the largest selection of national and exclusive outdoor power brands, such as John Deere, Cub Cadet, Toro and Ariens, all under one roof to help you match the perfect riding lawn mower to your needs and your budget. With so many brands, options and types of riding mowers on the market the decision process can be quite daunting. One of the benefits of a site like The Home Depot is having one easy location to research new mowers. ﻿Their website allows you to do side by side comparisons of mowers. This allows you to quickly compare features, pricing and warranty information. Some of the features that can be compared include: Engine Manufacturer, engine size, steering type, mower deck size, fuel tank capacity, head lights, hour meter and many more. Once you’ve narrowed your search it’s time to visit the store. Again this is where The Home Depot shines as you’ll be able to sit on major brands side by side for a true comparison. Be sure to bring some pertinent information with you to the store like the size of your yard, mowing terrain, and how often your grass needs mowing. 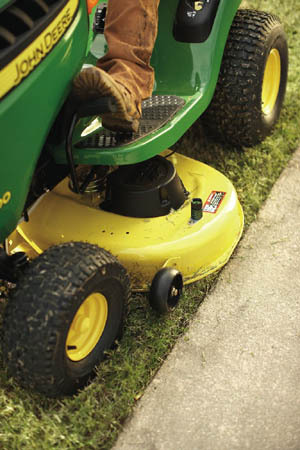 That way a sales associate can help you select the right features for your mowing needs. So be sure to check out The Home Depot’s Outdoor Power Equipment website for a huge selection of mowers. Wait wasn’t it you who had a problem with plastic parts in your HD JD lawn mower? I have a John Deere X300 purchased from a Dealer. You’re referring to a discussion that several of us had about whether big box stores sell a different model on JD mowers vs dealers. However, since that time we’ve received confirmation from JD that their mowers are the same whether at a dealer or HD. There were some folks talking about transmission issues on a model that they thought might have plastic. If you remember correctly it was a pretty heated battle.